The 2018 FIFA World Cup is officially underway! As 32 nations battle it out to become the next World Cup Champion, millions of people across the globe are tuning in to witness this historic event. While the thrill and excitement of each matchup takes center stage, many large sponsors/companies have subtly and strategically placed themselves deep within the game. 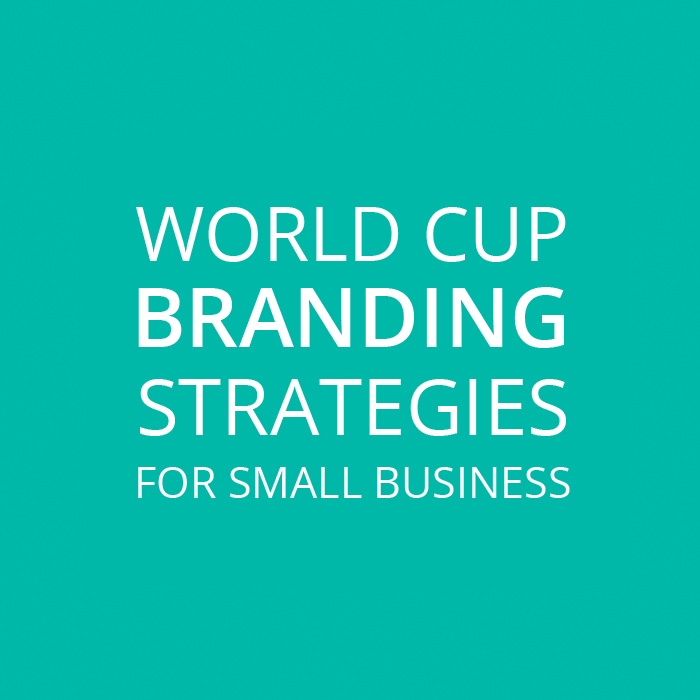 As such, the World Cup is an excellent time for small businesses to take notice, and reflect upon these carefully crafted forms of brand exposure. Of the two forms of branding, direct branding is the most noticeable to viewers. This marketing approach consists of positioning brand names and logos in as many places as possible. In the World Cup, we see this via electronic signs along the sidelines, backdrops for post game interviews, and commercials during halftime. Some of the most prominent sponsorships include: Coca-Cola, Budweiser, and McDonald's. And while these companies compete for top exposure, direct branding (especially in the World Cup) requires a LOT of money. Obviously, the costs are well beyond the scope of any small business. However, that doesn't mean direct branding isn't a good option for you. You just have to think creatively. Take for example the effectiveness of Coca-Cola's "share-a-coke" campaign. Putting the large-scale budget aside, this marketing strategy is genius. The slogan is short, memorable, and to the point. Coca-Cola encourages you to share their products with friends, family, and anyone close to you, rather than focusing on the individual's consumption habits. They have a fun selection of names and phrases labeled on the bottles, and they give consumers the freedom of choice. This is an example of direct branding done right. While your budget is probably tighter than that of Coca-Cola's, there are ways in which your business can emulate effective direct branding. For instance, a well-thought-out social media campaign can be a powerful (and cost effective) approach to adding exposure to your brand. Additionally, incentive programs may inspire customers to share your products on a larger scale. So don't be afraid to branch out. The more eyes that see you, the better! While direct branding is a useful strategy for gaining customers, indirect branding can leave a greater lasting impression. This marketing approach is oftentimes less apparent to viewers, mainly because it's an appeal to the emotions, rather than a direct a message saying "buy me." For example, in the World Cup, we see this via the player's jerseys, the fan's sportswear, and even the Official World Cup ball. Many successful businesses understand the power of indirect branding, and Adidas is no exception. As a partner with FIFA (Fédération Internationale De Football Association), and as the official ball supplier for the World Cup since 1970, Adidas has established themselves as top dog in the worldwide football community. But what makes them stand out above the others? Every four years, Adidas designs a unique ball for the World Cup using innovative technology and artistic aesthetics. While some designs have stirred criticism among the players, for example the perceived awkward aerodynamics of the 2006 Teamgist and the 2010 Jabulani ball, the designs invariably attract intrigue and fascination among the fans. So much so, in fact, that I remember back in 2010 going online and purchasing an "official" South African World Cup Jabulani ball. For me, I had never really been interested in watching soccer, that is, until my Spanish professor played the opening match (Mexico versus South Africa) during class on the projector. I was mesmerized. The game was thrilling, the colors were magnificent, and the Jabulani was the centerpiece to it all. 1. Don't buy into any deal that seems too good to be true (a bit obvious now, looking back). 2. Branding is a powerful tool. While I didn't exactly get the "official" ball I was hoping for, I did take notice of how effective Adidas was in their marketing strategy. Their approach was (and still is) to let the products speak for themselves. And as mentioned earlier, create an "icon" that leaves a lasting impression. This is something every business should pay attention to. If your business sells a product, how can you present it in a new and exciting way? What makes your product stand out above the rest? And, will your product alone convince customers to buy? For me, the Jabulani was more than just a soccer ball. It stood for the games, the memories, and a snapshot of history. What does your product stand for? Therefore, as we watch history unfold these next few weeks, I encourage you to take notice of the direct and indirect forms of branding. How effective are these marketing strategies for you? And what images come to mind when you think of the World Cup 2018? It doesn't have to take a long time. Just reflect on what appeals to your emotions. See if you can apply that same feeling to your business. With that said, enjoy the rest of the World Cup, and have fun!